Rooted in Americana and spouting a folk pop sensibility, Emma Hill’s Clumsy Seduction is rife with discovery. From unusual tempo changes to unexpected torch songs, from flirting with found sounds to cracking up on hidden tracks, there are surprises around each turn. 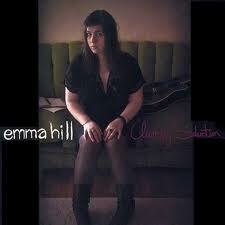 But there is one constant which links the songs on this album, and that is Emma Hill’s big voice. Rich, with a hint of smokiness and just a suggestion of twang, it’s a substantial voice that is almost startling in its expanse. That’s particularly surprising when you consider that Emma Hill is barely into her twenties. A seasoned musician from Alaska, now residing in Portland, she projects an endearing fearlessness. She is no stranger to the road, is Ms Hill, with a solo Greyhound tour under her belt and, more recently, having completely a blistering cross-country tour via a JetBlue All You Can Jet pass. There is a playfulness to Emma Hill’s music. Her seduction techniques may be clumsy, but she is good natured about the rejection; she may find solace in the bottom of the bottle, but she revels in drinking the boys under the table. In a curious reversal of the perceived wisdom of track mixing, I find myself returning more often to the songs in the bottom half of the album. This is where you find the real gems, the tracks that infiltrate your consciousness, the songs that truly showcase the diversity of Emma Hill’s voice. Songs like I am the Rock, You are the Wind and Highway 101 hearken back to the very roots of Americana, fitting like a tattered cardigan against the winds of change, while the stunning torch song, Doctor, suggests a future fit for Emma Hill amongst the great American ladies of song. Clumsy Seduction is a richly diverse album, and Emma Hill is a versatile musician who is making strides. There is talk of an upcoming Canadian tour, so watch for Emma Hill and her evocatively-named Gentlemen Callers on the upcoming concert circuit. Another superb piece of writing! Haven't heard this album but I definitely will look for it! she has a great band name. The way you describe her voice, she sounds like Neko Case. Would that be a fair comparison? The sign of a great review? The fact that I have added this release to my "must get" list on your word(s) alone. Well done my friend and kudos on the No Depression front page! Really looking forward to this one. You are too kind, Susan! I'm really happy to have been introduced to this album, though. It's definitely expanded my library. In some ways, John. Her voice has a completely different timbre from Neko's, a little closer to Kathleen Edward's perhaps, but it has a similar power to Neko's. You are too kind, by far, Sean! I was utterly chuffed that No Depression featured this review, such an honour. And of course, one of the finer things in life is the chance to talk music with friends, to hear new sounds with them, to celebrate old favourites together. We'll be doing that when we are centenarians, I think. Great review, Barb! And kudos on the feature too! I haven't heard of this artist before, but I will certaintly be checking her out. I love the cover to this album too. Thanks, Al! I think she's definitely got a career ahead of her, especially since she is still so young.